Dosbat: Cold Winters: Arctic Sea Ice. On this issue a key paper I'd recommend as a starting point for anyone interested is Dagmar Budikova's excellent 2008 review of the science. The relationship between Northern Hemisphere winter weather and Arctic sea-ice conditions in the preceding summer has been suspected as early as 1914. Reduced sea-ice cover results in a reduction of westerlies and storm intensity north of 45degN, with an increase in westerlies in sub-tropical regions. Surface air temperatures at mid latitudes decline with the decline of sea-ice. Perhaps the most important potential impact is in affecting the wavenumber and phase of westerly circulation. 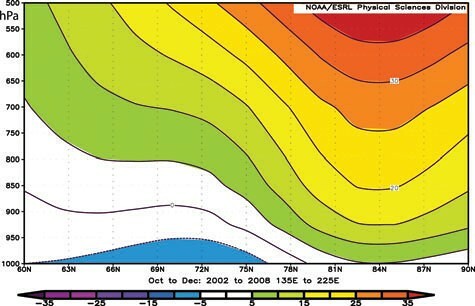 As previously discussed in my post on UV impacts on winter the Jetstream has 'wiggles' on it that are Rossby waves. The wavenumber is the number of 'wiggles' caused by the Rossby waves as they circle the Northern Hemisphere, the phase is where those 'wiggles' occur. So not only can the number of semi-permanent lows/highs in the northern hemisphere change (wavenumber), their positions can change too (phase). Judah Cohen, who's work on Siberian snowfall and Northern Hemisphere winters was previously discussed, argues that direct impacts from the loss of Arctic sea-ice are less likely to have a widespread effect on the Northern Hemipshere. He has stated that this is because activity at the pole is least able to affect atmospheric waves, whereas activity in a region like Siberia is ideally placed to do so, being on the path of westerly waves. However as Francis et al show, the geopotential height thickness in both the Atlantic and Pacific basins is impacted during years of reduced sea-ice. And as I have shown, there appears to be a wider response of the summer atmosphere during recent years that is not found in earlier periods, the implication being that summer weather is impacted by reduced Arctic sea-ice cover. Overland et al cite Francis et al's 2009 study examining the persistence of mid lattitude impacts of reduced sea-ice. Francis et al examine atmospheric differences between years of above and below normal sea-ice extent. Their figure 3 is reproduced below. Francis et al, figure 3. 1000 to 500 hPa thickness during years in which the sea-ice is (red) above normal and (blue) below normal. The geopotential height thickness between 1000 and 500hPa is the thickness between the height at which the atmosphere has a pressure of 1000hPa (near the surface) and the height at which pressure is 500hPa (the middle of the troposphere). The graphs above show that in years of below normal Arctic sea-ice extent the difference in height between 1000 and 500 hPa is reduced and that this reduction persists throughout the winter. This effect is most marked in the Atlantic Basin, although it occurs to a lesser degree in the Pacific Basin. Crucially the effect indicates a memory of Northern Hemisphere circulation that carries over the summer sea-ice conditions to affect the following winter. This result from Francis et al is further examined by Overland & Wang. They note that whilst the geopotential height thicknes and temperature show a consistent impact, geopotential heights themselves, winds and sea level pressure show greater variability. Overland & Wang state that this is because the change in geopotential height thickness is baroclinic, whereas the more variable factors are due to barotropic atmospheric behaviour. In a baroclinic atmosphere the density depends on both the temperature and the pressure, whereas in a barotropic atmosphere the density only depends on the pressure. So the change in geopotential height thickness seems to be a consequence of the lower tropospheric warming due to Arctic sea-ice reductions. This is backed up by Francis et al's finding of a connection between geopotential height thickness and Arctic sea-ice extent. Furthermore both 850 hPa geopotential height anomaly and zonal wind anomaly fields between 2002 and 2008 show centres of action in the Beaufort/Canadian Arctic Archipelago/Alaskan sectors of the Arctic, those sectors are where the sea-ice recession has been most marked. As I've discussed on this blog previously there is an atmospheric disturbance caused by the Arctic sea-ice reduction. Overland & Wang figure 4 shows NCEP/NCAR reanalysis temperature from the Beaufort Sea to the Laptev Sea and towards the Pole. Overland & Wang, figure 4. 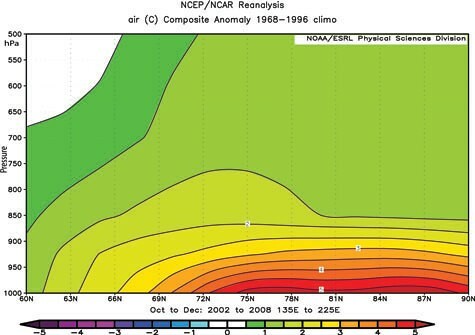 Temperature anomaly profile of Arctic atmosphere. This temperature anomaly for most years over 2002 to 2008 is strongest over the ice, not (as might be expected) over peripheral open water or thin ice, such as nilas. Schweiger et al (referenced by Overland & Wang) helps to go some way towards explaining this. Schweiger et al figure 11 and associated text shows the different energy flux components between above and below normal sea ice years. The greatest contributors to the difference between above and below normal sea-ice extent are sensible (that which can be sensed) and latent (the heat implied by the freeze/melt of water/ice) heat fluxes. Whilst longwave (infra-red) up and down appear to be large the net longwave flux is not as great as sensible and latent heat fluxes, furthermore the changes compared to the absolute values are small, which is not the case for sensible and latent fluxes. Overland & Wang figure 4 is for the period October to December, and Schweiger et al figure 11 is for the period September to November. However Schwieger et al consider 1980 to 2000, whereas Overland & Wang covers 2002 to 2008. As the sea-ice recession and late re-freeze is more marked in the latter period than the former the two periods can be considered to be covering similar sea-ice conditions. So it seems reasonable to conclude that most of the lower troposphere temperature increase seen across the Arctic is due to the late re-freeze of sea-ice in the early freeze season, specifically the heat released as ice forms and increased fluxes of heat through the ice to the atmosphere. Overland & Wang, figure 7. Geopotential height anomalies of Arctic atmosphere. Whatever the exact cause this lower troposphere warming causes an impact on the geopotential heights across the Arctic basin. Overland & Wang figure 7 is the atmospheric profile for the same region as their figure 4. Over the region of near surface warming shown in Overland & Wang figure 4 the atmospheric pressure profile is shifted upwards in a bell-like profile, a 'hump' of raised geopotential heights over the Arctic in the early freeze season. To be clear; this corresponds with the green, yellow and red region in the above graph. This effect disturbs the surrounding atmosphere leading to the hemispheric impacts that persist over the following winter as seen in Francis et al figure 3. This reduction in geopotential height thickness is anticipated to reduce the strength of the jetstream and increase the occurrence of atmospheric blocking patterns in Europe. Once blocked by such a persistent pattern, the jetstream is then unable to channel warm maritime air into Europe which would keep winters mild. As reported by Realclimate Petoukhov & Semenov carried out a model study examining the role of future sea-ice reductions in the Barents and Kara Seas. They used sea-ice concentrations set at different levels through the period November to April. Unfortunately while MASIE provides csv files they're for daily amounts. The only way of working out where we are now in Barents/Kara on a long term basis is by using estimates from Cryosphere Today's regional graphs. I've taken the recent anomalies and area graphs and estimated the typical monthly values from November to April, using this I've worked out what percentage of ice area we're currently at in Barents and Kara combined. The figure I've got is around 75% (given the method there's no point in quoting a more accurate figure). Petoukhov & Semenov find a winter cooling in the Northern US, Europe and across Siberia to China for sea-ice reductions from 80% to 40%. So it would seem that at ~75% we're now in the ballpark to be seeing the onset of this modelled effect causing cold winters. As with the Solar UV connection there is now enough evidence with regards reduced sea-ice to expect it's reduction to cause colder winters. It is important to note that the two factors do not challenge each other, they are two seperate factors that are both acting to increase the chance of colder winters. This should not however be taken to mean that every winter will be unusually cold. As this post is already long enough I've posted some links below regarding the Warm Arctic - Cold Continents Pattern. Dagmar Budikova, 2008, "Role of Arctic sea ice in global atmospheric circulation: A review." Francis et al, 2009, "Winter Northern Hemisphere weather patterns remember summer Arctic sea-ice extent." Overland & Wang, 2010, "Large-scale atmospheric circulation changes are associated with the recent loss of Arctic sea ice." Petoukhov & Semenov, 2010, "A link between reduced Barents-Kara sea ice and cold winter extremes over northern continents." Schwieger et al, 2008, "Relationships between Arctic Sea Ice and Clouds during Autumn." More reading: 'Warm Arctic - Cold Continents' pattern. James Overland presentation. Slow download! NOAA page on Warm Arctic Cold Continents.